It goes down on top of wood or concrete subfloors. Your tile then goes on the DITRA. 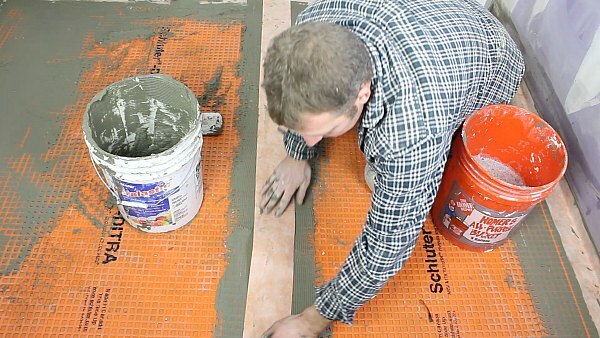 Today we’ll show you how to install DITRA on a wood subfloor. PLUS you get to see a pro tile installer do it. 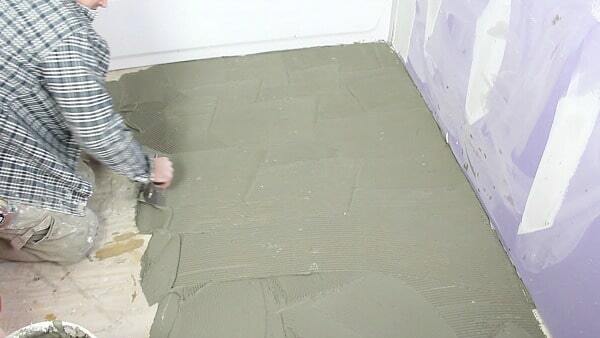 This tutorials is gonna make your tile installation way faster!! Tile floors…there’s no doubt they make homes look nicer. But what’s not so awesome are broken tiles. This is a HUGE issue if your home settles over time. The best part is anyone can install it. DITRA is way easier to install than cement board. Second, it stops tile and grout from cracking. Third, it can waterproof the wood subfloor. If you’re afraid of mold in the bathroom DITRA will help. 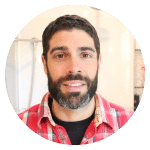 Steve and I will show you how to install DITRA today and make it 100% waterproof. So what’s the first step when installing DITRA on a wood subfloor? I’ve called them in New York like 2,989.384 times. They answer the phone every time!! Schluter also has the best installation directions. Hey, they’re German and you know what that means…DETAILS my friend. Know the joist spacing of your home before installing DITRA. BUT again, this tutorial is just for wood subfloors. 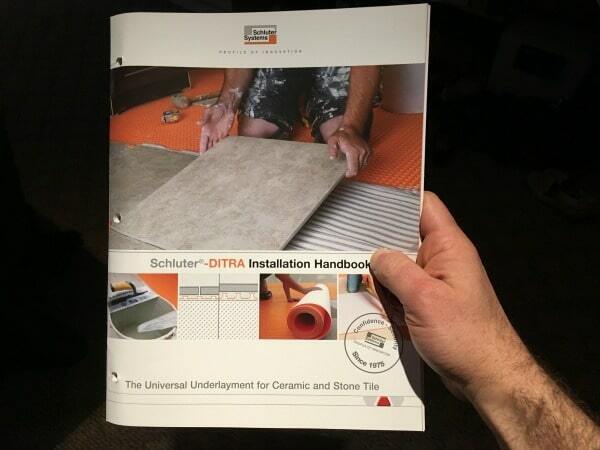 All the specifics for DITRA installation are in the handbook or on Schluter’s site. ensure subfloor panels are level and properly fastened to the joists. Inspect the floor for protruding nails or screws (fix squeaks before installing any flooring). you’ll want to take care of this issue. The big problem with tight subfloor seams is they don’t allow for expansion and contraction. Hence the need for 1/8″ gaps between seams. Let’s dive into the installation process. 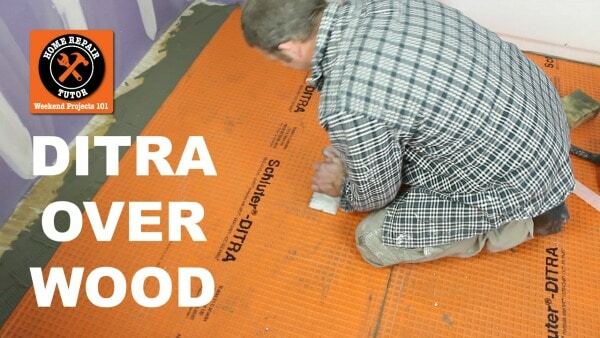 Once your subfloor is good to go it’s time to install the DITRA. Thin-set should be mixed to a fairly fluid consistency. BUT should still hold a notch. How do you know you have the right modified thin-set? Look on the bag for ANSI A118.1. Again, modified thin-set is what you want between DITRA and the wood subfloor. Measure the floor dimensions and cut your DITRA. You can cut DITRA with a utility knife. Clean and dampen the wood subfloor. This creates a solid bond between the thin-set and DITRA. 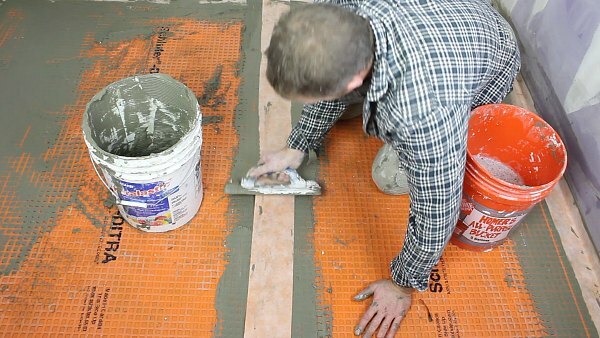 What trowel should you use to apply thin-set to the wood subfloor? Apply the thin-set to the wood subfloor. Notches should all run in the same direction. Embed the fleece side of the DITRA in the thin-set. 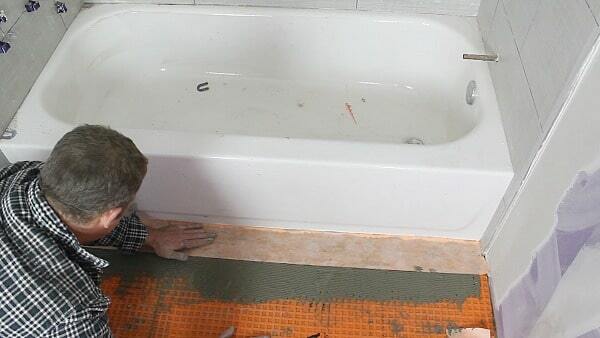 Leave a 1/4″ gap between walls and the bathtub. Lift up a corner of the DITRA to check for thin-set coverage. Your goal should be 100% coverage…we had a few bare spots here and fixed that issue!! You can abut end and side sections of adjacent DITRA sheets. Now for the waterproofing step!! isn’t DITRA way better than cement board? I’ve put my back out many of times lugging cement board. Not to mention that you have to attach cement board panels using screws. Each screw represents a leak point for water. So how easy is it to waterproof DITRA? 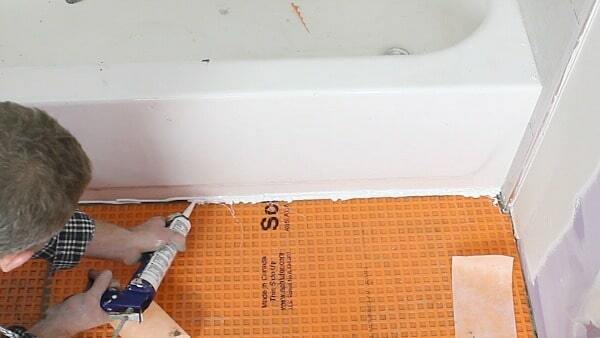 At the joints, fill the cavities with unmodified thin-set mortar. Make about an 8 inch band of thin-set centered over DITRA joints. Comb additional thin-set over the joint using an approved trowel. Center the 5 inch wide KERDI-BAND over the joint. With the flat side of the trowel, firmly press the KERDI-BAND into the mortar. Make sure to fully embed the KERDI-BAND and remove any excess mortar and air pockets. 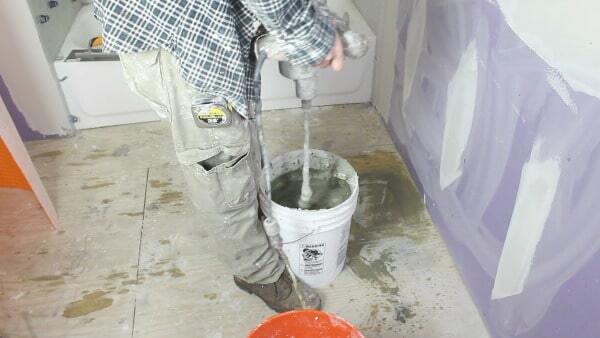 You can use this same method where DITRA meets drywall. We used a 5 inch wide KERDI-BAND because if it’s centered, your base molding will hide it. Check out the video for those details. 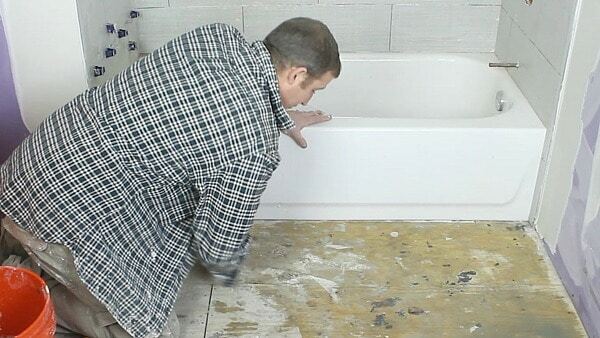 One of the worst spots for water damage is where your tub meets the tile floor. Fill the 1/4 inch gap between the DITRA and tub with KERDI-FIX. you’ll be a whiz at DITRA installation after today! 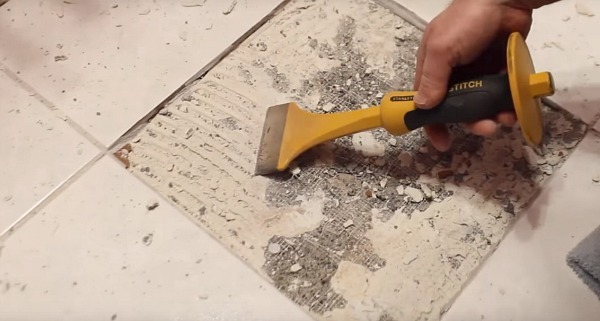 DITRA is the easiest way to waterproof your floor and prevent tile & grout from cracking. Hopefully this tutorial on DITRA was helpful. We also have a great step-by-step tutorial on how to install DITRA-HEAT. If you hate cold floors DITRA-HEAT is a fantastic option. Hi, I have a wooden sub-floor in my 1/2 bath that appears to be level to the naked eye. Do I need to use a leveling product before using DITRA, or will DITRA take care of any minor inconsistencies? Also, I think I need to pull out vanity, baseboards and toilet, install DITRA and then tile entire bath before reinstalling new toilet, vanity and baseboards. Is this correct? I may just surprise my husband by remodeling our 1/2 bath by myself! Thx! Unlike Faye above, I know my subfloor is not level. When I pulled up the contractor grade sheet flooring, the leveling material came away in patches. So I removed it all to the plywood. The peel n stick tile I put down cracked within a year. Can I use a self leveling product under DITRA? I don’t think I can redo the subfloor. 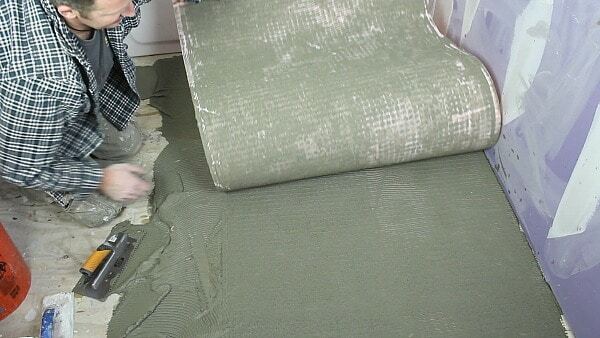 You can use self-leveling material under DITRA Dave, just make sure it’s completely dry before applying the thin-set. Sorry to hear about your issues, awe homeownership, the joys of DIY!! How about over vinyl tiles?. 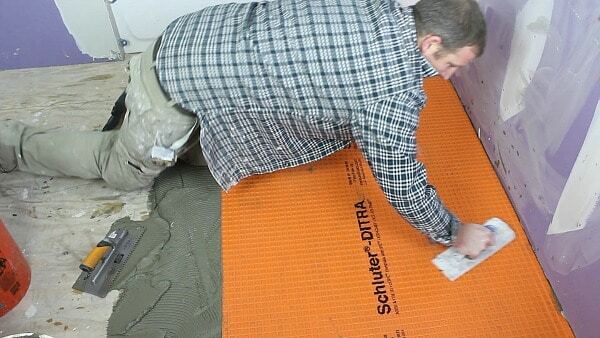 You can install DITRA over vinyl but make sure to follow the Schluter directions to a “T”. I’d personally recommend tearing up the tiles so as to inspect the subfloor for any damage. But if you’re sure the subfloor is solid, no water damage, and there aren’t other products under the vinyl…you could install DITRA over it. Hi Jeff. Here, on the podcast, and in the videos it says to lay down MODIFIED thin-set. It also says to use ANSI A118.1. However, ANSI A118.1 is for unmodified thin-set (ANSI A118.4 is for modified). Also, the Schluter installation handbook also recommends using unmodified thin-set (ANSI A118.1) to lay down Ditra over wood. Am I misreading this? Hi Jeff. I re-read Schluter’s install guide and you are correct to set the Ditra down it should use MODIFIED thin-set However, the standard above for MODIFIED should ANSI A118.11 (its currently listed as ANSI A118.1 which is for unmodified thin-set). I am planning to put porcelai tiles on top of ditra. The Ditra will be on the vinyl over plywood. The installation manual says that I need to put a screw/nail through vinyl/ply every 4 inches that is about 9 nails per square foot. This is too much of screws. Is it really needed? Is it better to put cement boards on wood floor first before installing Ditra? I am really interested in your product but I have a question, how would you install this product if part of your design includes a radiant floor. Can/should the radiant floor be installed on top? If so is there a restriction of which type of floor install? Joyce, great news. 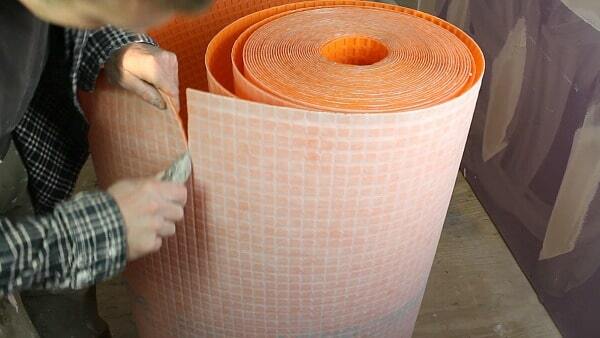 Schluter makes a radiant floor system called Ditra Heat. It is an all inclusive system; mat, wiring, etc. Easiest install on the market. What are the benefits of Ditra over the RedGard uncoupling mat? I see the Ditra installation uses both modified and modified thinset. Wouldn’t the RedGard be less complicated due to using all modified thinset? 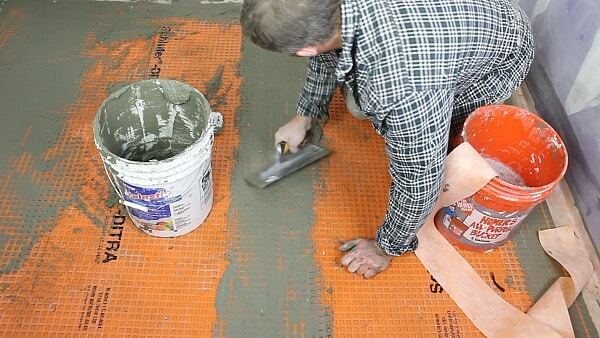 One way to cut down on the confusion Ken is to use Schluter’s ALL-SET. It’s a thin-set meant for both under and over DITRA. We like DITRA because it’s never failed us and the installation is very straight forward. Can you make a video on tiling the shower ceiling with smaller mosaic tile and to keep in place and how yo cut these tiles on a wet saw without them falling off the webbed backing. 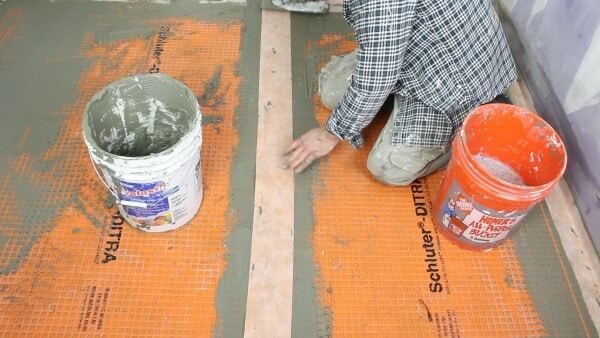 This was one challenging job ..so please help anyone else trying to do this, using schluter thinset. THANKS GUYS ! Can I use ditra over cement board like duroc? My toilet leaked and created some water damage into the lower floor. I plan on replacing the plywood subfloor in the entire bathroom before adding the Ditra floor. What kind and thickness of plywood do you recommend to use with the Shluter? Do I have to tile over the Kerdi band where floor.meets wll or can I install pvc moulding? When I removed a cracked tile in my kitchen to replace it, the corner of the Ditra pulled up. Is there a way to reattach it or is it okay to go ahead and replace the tile? If the plywood floor in the bathroom is not level, do you recommend using a self leveling compound and then installing Ditra over it?